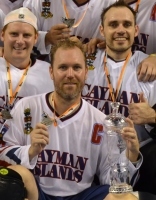 (CIBHA): The Cayman Islands National Ball Hockey Team have claimed victory, at the International Street & Ball Hockey Federation (ISBHF) World Championships held in Bratislava Slovakia 19 – 26 June, in the 2nd division of the B-POOL defeating Hong Kong 2:1 earlier today. The win in the 2nd division affords Cayman to claim 5th place in the B-POOL, the highest ranking to date at the ISBHF World Championships. Pete Holochuck #25 scored the first goal of the game with the winning goal scored in the final minute of the game by Rob Rintoul #48 to break the tie. General Manager Mark Thompson and Coach Karl Galbraith are extremely pleased with the teams' performance.